me of her and a basket of flowers so here is Frida's Basket. on my dress. I pulled my hair into a ponytail type bun. Wearing a dress like this is such a simple way to be comfortable yet glam. 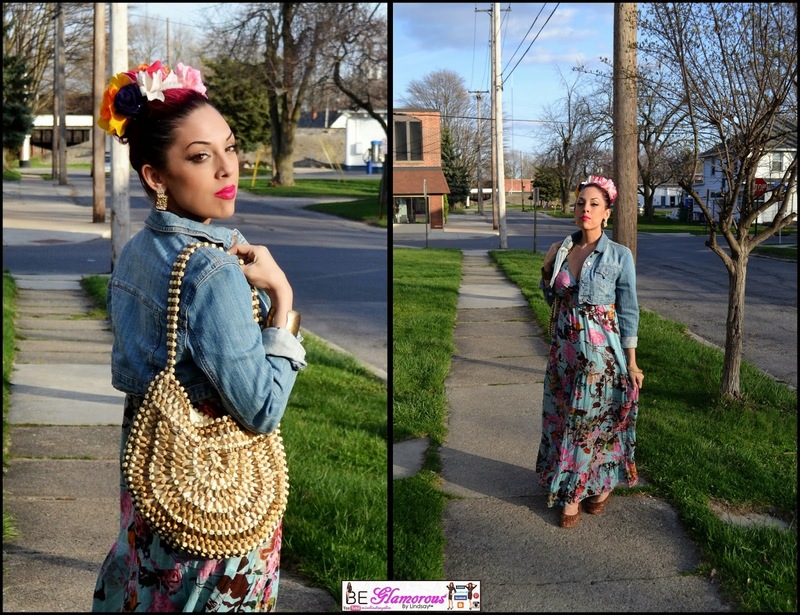 I love a good maxi dress and the jean jacket is a staple for every spring wardrobe. My jewelry is simple costume gold pieces, just a few pieces because the pattern on the dress and the adorned hair is already busy and an accessory in itself. I don't like wearing heels or wedges with a long dress like this, you can get away with wearing cute flats. I found these vintage 'basket' style flats out thrifting. They are super comfortable and the perfect ending to this outfit. add more spice to such a simple look.